We as digital savvy people now tend to digest information and news from different channels, but did you ever think this would be from a recycling bin? Well, the City of London has announced they have fitted 100 new paper recycling bins that will have a news feed, transport information and advertisements displayed via digital displays. 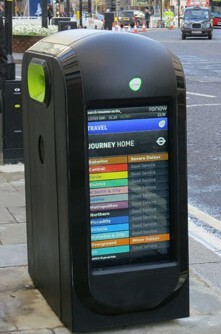 The new informative bins have been created by a company called Renew. The recycling bins will double up as an open-air information screen. 100 of the bins have been placed around the City of London as part of a 21 year contract the company has with the local authority. The recycling bins have been designed and built to withstand the harsh weather as well as potential vandalism. They are made of damage-resistant fibreglass with screens at either end which can relay anything from news to advertisements to information on London underground delays or the number of Boris bikes available in the vicinity. The hi-tech recycling bins can also be used for emergency messages, with one recent test showing an alert reaching the system just three minutes after being received at the control room. With free papers now being handed out at all tube stations; the City was starting to become littered with disregarded papers and magazines. Hence, the City of London wanted a solution to help recycle more paper waste. The bins were originally planned to be rolled out in time for the Olympics, but that deadline was pushed back – they were finally rolled out last November. The great thing is, these have not cost the taxpayer anything, the company Renew intends to make its money back via advertisers. With the bins now in place Renew has begun its real push to advertisers and media, with marketing campaigns under way for a number of businesses including CNBC, Qatari Islamic Bank, and Wallpaper, as well as a couple of charities which have been given free or heavily discounted airtime.